1. 100% Pure Coton, Soft and comfortable. Best chice for HOME Textile. Enjoylife is a high-Quality store in Home Textile, we mainly produce and sell duvet cover set, made from 100% Cotton, Long-staple cotton, Soft Velvet, Pure Flax/linen, or Pima Cotton, or better materials. Package includes 3 pcs set: 1*Full/Queen Duvet Cover 90*90"+ 2*Pillowcases 20*26" // Attention: Comforter / Quilt not included!!! 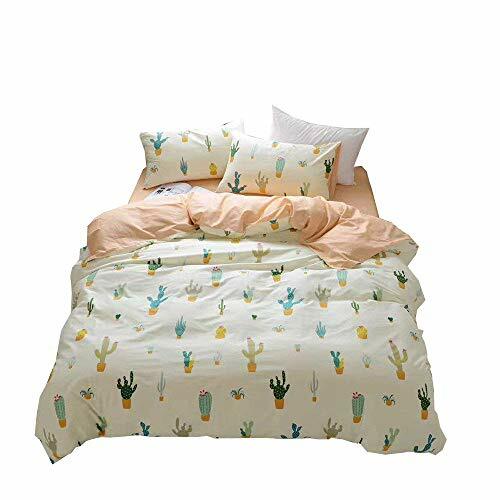 The duvet cover and matching pillow shams feature sweet cactus print pattern.